According to Harry Sinden, the former general manager, coach and president for the Boston Bruins, the “power forward” verbiage first came of age to describe the play of Cam Neely — a rugged player who could score goals — during his NHL tenure in the 80s and 90s. 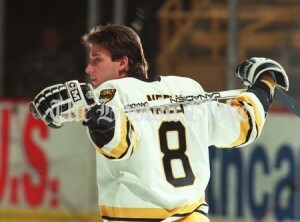 “Bam Bam” Cam Neely racked up 694 points in 724 career games, not to mention 1241 PIMs. Yet once the NHL adopted the new post-lockout policy eliminating all stick work and free-hand impediments, was the traditional power forward notion lost in translation? Yes — the emergence of the agitator. The post-lockout NHL spawned a new, distinct breed of player: the agitator. Sean Avery, Steve Ott, Daniel Carcillo, Patrick Kaleta, Steve Downie, Alex Burrows come to mind, and all are either loved or loathed depending on the given venue. Some can score, some can’t and few argue their effectiveness. Yes — higher skill level and a less violent brand of hockey. Teams have realized that their some of their power forwards are also their most skilled players, and as a result, power forwards aren’t taking as many penalties at crucial moments in games. Anaheim Ducks defenseman Paul Mara recently said he’d gladly fight in place of Getzlaf, as the team reaps no benefit from having their best player off the ice for five minutes. The league is also walking on thin ice as it tries to navigate in the wake of serious concussions and head injuries. Goalie fights, bench-clearing brawls and shoeless Mike Milbury’s are not the images the league is trying to promote. Players are often being sent to the box for unsportsmanlike conduct before a potential fight erupts, maintaining the pace of play and avoiding potentially dangerous situations for players and referees alike. No — once a power forward, always a power forward. Clowe earned First Star honors for NHL’s Player of the Week, Dec. 6 to Dec. 12 and has 28 points to complement six fighting majors. His power-play numbers aren’t on par with a season ago, but he is excelling at even strength; a welcome tradeoff (Clowe is currently plus-10) for a Sharks team that relies so heavily upon its man-advantage scoring. The 2006 first-rounder exploded on the Denver scene last season and was on pace to eclipse his 2009-2010 marks before breaking his left hand in a late November fight. The 23-year-old Canadian sits at 25 points in 23 games with eight power-play points and three game winners. He’ll be a welcome face for the oft-injured Colorado squad, likely returning a week or two after ringing in the new year. Neal found his niche skating alongside Brad Richards and Loui Eriksson in Big D and the trio has the Stars off to a pleasant start. The fourth-year player turned heads last season and has significantly increased production as he’s grown into his frame. Not a fisticuffs player by design, Neal will still drop the mitts if called upon. The multi-faceted Kesler, who was once property of the Philadelphia Flyers for two days, was lauded for his play during the 2010 Winter Olympics at his home rink in Vancouver and finished second (655 votes) in Selke voting to Pavel Dastyuk (688). Kesler is the handyman out in western Canada and was rewarded in the off-season with a $30 million, six-year deal. Perhaps the hair was weighing Hartnell down in 2009, as the perennial PIMs grabber seems to have returned to form with 76 PIMs, 20 points and a plus-15 rating to boot. Hartnell recently donated his familiar curly red coif to Locks of Love, and the gesture is likely paying dividends for both parties. Injuries limited Lucic to just 50 games in 2009-2010, but Lucic has come back with a vengeance, thanks in part to mates David Krejci and Nathan Horton. Lucic’s numbers are eerily similar to those of Clowe’s, but Lucic has the clear advantage in goals with 15. Backes was somewhat of a disappointment for some fantasy owners in 2009-2010, but his point totals only dipped slightly from his 31-goal season in 2008-2009, mainly a result of shooting less. Interestingly enough, out of Backes’ 104 PIMs last year, only 25 came as a result of dropping the gloves. Rarely can one player potentially match points and PIMs, albeit three of them. Ryan Getzlaf, Corey Perry and Bobby Ryan not only skate on the same line but represent the prototype for the contemporary power forward. Possibly the only thing setting Bobby Ryan apart is his ambidextrousness.